A famous footwear fashion mogul broke sales records when he stepped out of his comfort zone and ventured into scratch card marketing. Black Friday, the biggest sales day of the year was fast approaching. Steve Madden retailers knew that millions of customers would be expecting massive deals…everywhere. In order to beat the competition, management would have to come up with a plan that would make them stand out from the rest. They broke the mold and decided to keep everything in their store the regular price. But they would offer every customer a Scratch and Win card, worth valuable discounts and free merchandise. They created: 325,000 3 x 5 scratch and win cards. Prizes ranged from free shoes and handbags to savings worth 20%, 30%, 40%, and 50% off. The footwear company was later quoted as saying “It was the biggest and most successful sales day in the history of our stores!” – Steve Madden, National Footwear Brand. What are Scratch off cards? Why are Scratch and Win promotions successful? They grab the attention of prospects and customers. They make shopping fun- Everybody likes to win. They create brand awareness and generate buzz. How can I use Scratch off cards? Gift Cards: Gift cards can increase profits, attract new customers and minimize lost revenue. Most customers spend more than the value of the gift card, thus increasing your bottom line. Save the Date: This is popular in the wedding industry and among event planners. Scratch off cards can be used for surprise parties, weddings, anniversary celebrations, baptisms and other special events. Guests must scratch the card, before the date, location and venue are revealed. Gender Reveal: Expectant parents like to surprise friends and family with mystery scratch off cards. In order to learn the gender of the new arrival, recipients must first scratch off the card. 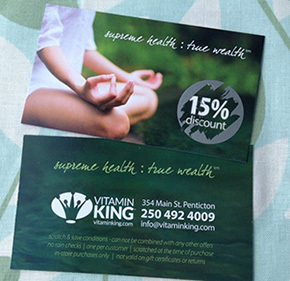 Sales Promotions: Small business owners use scratch cards to mix and match sales promotions. For example, half of the cards can offer 25% off. The other half can offer buy one, get one free. Everybody is a winner. Fundraisers: Nonprofit organizations use scratch off cards to raise money. When donors scratch the card, a suggested donation amount will be revealed. If you use this technique, best practices suggest using donation amounts between one and ten dollars. How much do Scratch off cards cost? Prices vary and are based on a number of factors. Depending on the card size and number of customizable options, prices range from 4 cents to $2.00 per card. 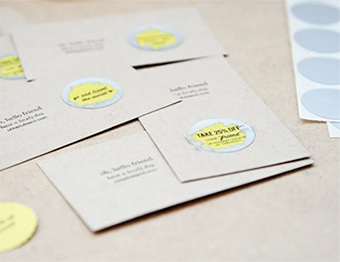 If you prefer to DIY, use an online printing service to design and order your postcards. Then order scratch off stickers separately. This option allows you to place the stickers on yourself. Scratch off stickers are available in a wide variety of shapes, sizes and colors. You can type the words “custom scratch off cards” into Google or Bing. As with most marketing strategies, it’s best to use a 3 or 4 pronged approach. 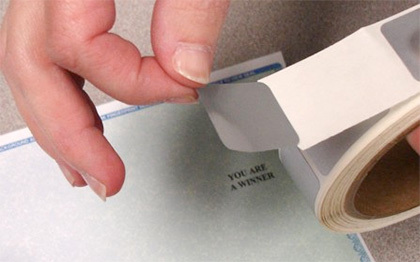 Scratch off cards can be one of four tools you use to grow your small business. Combine a scratch and win promotion with postcard mailers, brochures, QR codes, and digital marketing. 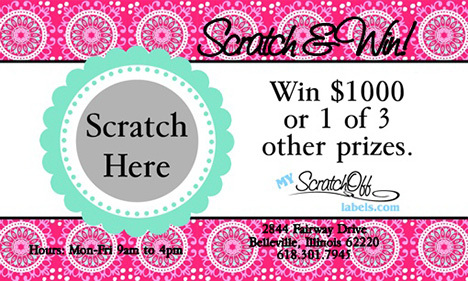 Now, write down three ways you can use scratch off cards to promote your business or an upcoming event. Go online and browse templates and themes for scratch off cards. If you like what you see, bookmark the page, and consider using promotional scratch off cards for your next sale or special event. For more ideas on how to grow your business without breaking the budget: From Zero to Hero with Integrated Marketing.